Where Does Frank Lloyd Wright’s Genius Come From? Frank Lloyd Wright, widely considered one of the greatest modern architects, was as known for his temper, narcissism, and dramatic personal life as he was for his innovative designs. Yet traditionally when history has looked back on him, Wright’s genius is often perceived as an innate, immutable quality outside the influence of others, as if he—along with other perceived male geniuses—stood in the annals of history alone. Historians have recently begun to examine famous men’s relationships to others more deeply. This redefinition of history focuses less on innate talent, but instead on the emotional support, inspiration, and labor provided by those closest to them. And the redefinition argues that, had it not been for their relationships, these men would likely never have succeeded in honing and implementing their craft to an international audience. Much of this work has focused on women, whose close relationships to famous men are often hidden in plain sight. Rather than viewing women as passive muses whose beauty alone was a source of inspiration, historians have sought to more fully understand the active roles of these women in men’s lives. Want to learn more about Frank Lloyd Wright's work? We've got you covered, with stories, places, virtual tours, and more. Wright is no exception. His work was largely supported by his fellow architects, designers, and artisans, over 100 of whom were women; his familial and often romantic relationships with women; and his female patrons. In her short film “A Girl Is a Fellow Here,” former architect Beverly Willis sheds light on the many women employed by Wright throughout his lifetime—even though very few women studied or practiced architecture at that time. The documentary focuses on six women, including Wright’s first employee and lead designer, Marion Mahony, and Isabel Roberts, who was incorrectly referred to as Wright’s bookkeeper in several history books (she was actually an assistant architect). The specific roles of women employed by Wright were not limited to their gender, either: Men often cooked and cleaned, while women performed intensive manual labor like cutting wood and pouring concrete. In addition to those he employed, Wright also accepted a number of women into his apprenticeship program. The film addresses the societal norms and male-centric history that hid these women from view, often mischaracterizing or diminishing their relationships to Wright. More recent accounts of Wright’s personal life reveal the resounding influence women had over his architectural ideals. “How Frank Lloyd Wright Worked,” a story from HowStuffWorks by Jessika Toothman, mentions the many women Wright loved, beginning with his mother, Anna Lloyd Jones. Wright credited his choice of career path to his mother, and her ambitions for her son led her to remain a large part of his life until she died in 1923. 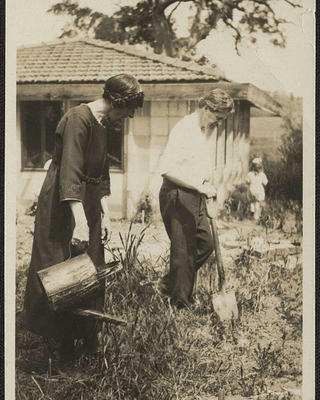 Marion Mahony Griffin and her husband, Walter Burley Griffin, garden at their home in Victoria, Australia. Frank Lloyd Wright built Taliesin for himself and his mistress, Martha "Mamah" Borthwick. The story also references Wright’s wives and mistresses—Catherine Lee Tobin, Mamah Borthwick Cheney, Maude Miriam Noel, and Olgivanna Lloyd Wright. Many of Wright’s relationships with women were tumultuous, but they also signified key points in his architectural career. For example, Wright married Tobin at the same time he set up his first practice and gained considerable acclaim for his participation in the Arts and Crafts Movement. During his affair with Cheney, Wright began building Taliesin in Spring Green, Wisconsin, for the couple. When Cheney, her two children, and four members of the house’s work crew were murdered and Taliesin was burned down, Wright met Noel (his mistress, then wife) and rebuilt Taliesin for the two of them. His third wife, Olgivanna Lloyd Wright, played a significant role in creating Wright’s Taliesin Fellowship, and continued to run it long after Wright’s death. Wright’s patrons also motivated many of his design decisions, even though their divergences in opinion were often a great source of tension between the architect and his clients. In her book Women and the Making of the Modern House, Alice T. Friedman examines Aline Barnsdall—a lover of the theater with impressively radical social views for her time—as one source of inspiration for Wright’s unique design of her home, Hollyhock House, in California. 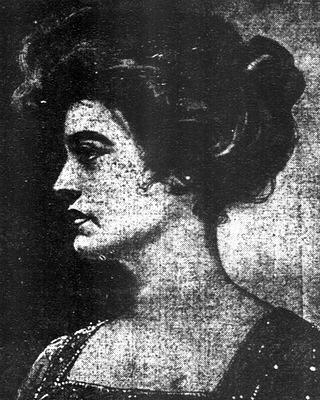 Barnsdall was an American heiress, feminist, and adamant single mother who was close friends with anarchist Emma Goldman. She was also a proponent of the qualities of Greek-style open air theater and believed that all-American California was the perfect place to begin experimenting with a theater company of her own. 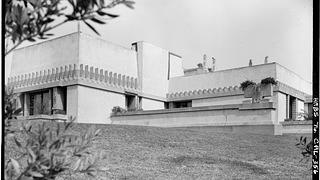 Hollyhock House in Los Angeles was built with theatricality and monumentalism in mind. At first, Wright deeply related to Barnsdall’s personality and rose up to the challenge of creating a non-domestic home. Interestingly, Wright never completed Olive Hill (the property on which Hollyhock House was built). He blamed Barnsdall entirely for his failure to finish his project—specifically citing her feminine weakness and inability to make her own decisions, instead falling under the influence of others. It seems that, in addition to conventional history, the architect himself tended to underestimate the contributions women made to his work, as well as to greatly overestimate his own ego. The one thing these accounts have in common? They note an inherently patriarchal society that prevents history from fully remembering these women, and they highlight that the work to look more deeply at the ways women contributed to Wright’s genius—and the perceived genius of other men—has only just begun. Join us in celebrating remarkable American women and the places where they made history.